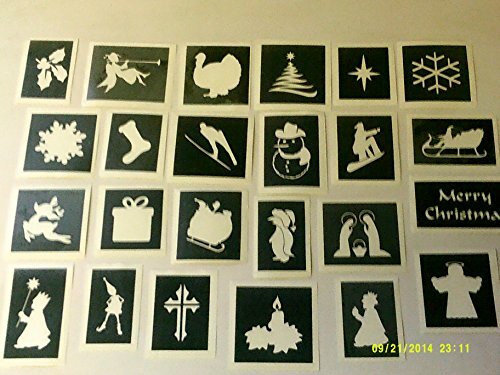 30 x Christmas themed stencils (mixed) for etching. Stencils comprise of 3 layers. Stencils for etching on to glass. These are made on a special vinyl especially suitable for etching on to glassware. Stencils measure approximately 3 cm x 3 cm. Stencils are one use only. If you are looking for these stencils for glitter tattoos / airbrush / henna - please look in our shop for these. Ideal for special gifts. Very easy to use. Please contact us with any questions or queries. Will aim to post within 24 hours of payment received. Please allow 7 days for delivery to USA / Canada. If you have any questions about this product by Dazzle Glitter Tattoos, contact us by completing and submitting the form below. If you are looking for a specif part number, please include it with your message.